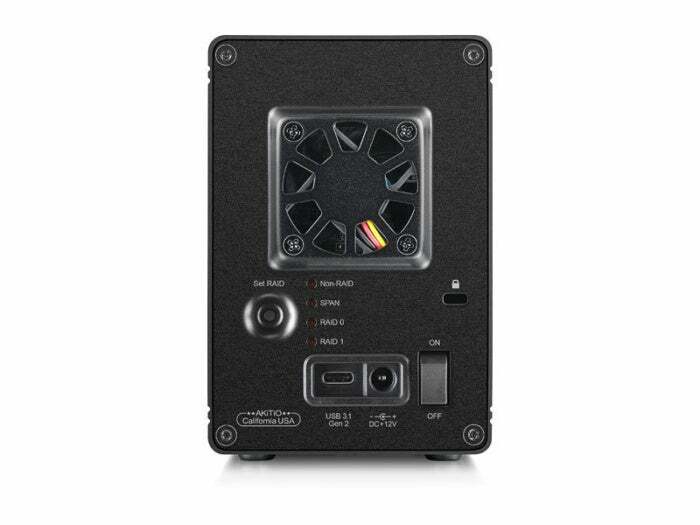 Two no-tools-required drive bays and three RAID modes make this a versatile USB 3.1 Gen 2 enclosure. 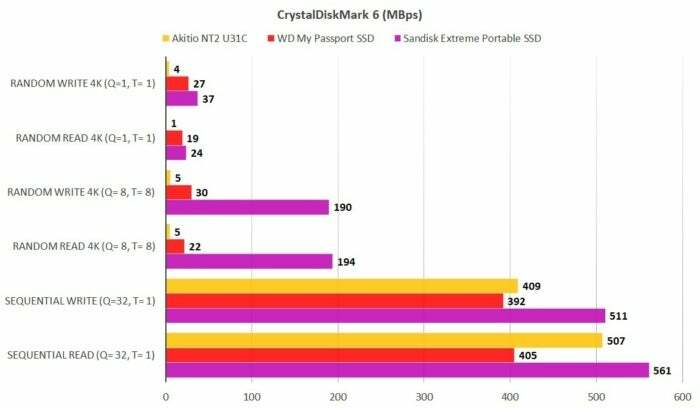 But it's best for 3.5-inch hard drives, not 2.5-inch SSDs or hard drives..
Akitio’s NT2 U31C offers mega-storage for people without mega-bucks. Sure, the privileged few may shell out for the uber-speed of Thunderbolt 3, but for most of us, USB 3.1 still reigns. You could opt for one of the many portable USB 3.1 hard drives (5Gbps Gen 1 types—10Gbps Gen 2 is overkill for platter-based media) if your needs are simple, or if you want faster throughput, a Gen 2 portable SSD. But if you want more storage that those options provide, then a desktop RAID box running a couple of today’s capacious 3.5-inch hard drives is what you want. The NT2 U31C is a dual-bay enclosure of minimal size—for a box that can hold two 3.5-inch hard drives, that is: approximately 7.2 inches long by 4.8 inches high, by 3.2 inches wide. The two drive bays are hidden behind a lockable, slide-off faceplate, and don’t require adapters or tools for 3.5-inch drives—just slide them in. Faceplate removal and attachment could be a bit smoother, but I’m being picky. The all-metal design is sturdy and well-designed despite the faceplate’s slightly awkward attachment. The NT2 U31C is a nice-looking box, and small considering that it will house two 3.5-inch hard drives. The fact that Akitio doesn’t provide 2.5-inch adapters seemed a bit strange. At least until I tested the unit with SSDs. More on that later. You can fit 2.5-inch hard drive or SSDs in the enclosure, but you’re on your own for securing them. Akitio recommends its Neutrino bridge adapter, but at $45 a pop (it also serves as an external USB 3.1 adapter), two are almost as expensive as the NT2 U31C itself. You can scrounge up a couple of adapters on Amazon for $6, or just insert the SSDs and let the pressure fit of the SATA power and data ports hold them in place, as I did. While this was sufficient for testing, I certainly wouldn’t recommend it for travel, nor for 2.5-inch hard drives under any circumstance, as they could sustain damage if they fall out while spinning. It’s easy to set the RAID mode for the NT2 U31C, but for data safety, it only works if you use drives that aren’t partitioned. On the back of the NT2 U31C unit are a power switch, the AC adapter port, the Type-C USB 3.1 port (Type-C to Type-C, and Type-C to Type-A cables are included), and the Set RAID button. Press and hold the Set RAID button while the drive is powered up but disconnected from the computer, and the four mode indicators (non-RAID/dual drive, Span, RAID 0, or RAID 1) will all light up. To set the RAID mode, press repeatedly until the proper indicator lights up. Long-press again until all four indicators light up, and the drives will be formatted. Note that you need drives that aren’t already partitioned. As a data safety precaution, the NT2 U31C won’t overwrite existing partitions. While you could easily just run the NT2 U31C as a mirrored RAID 1 array to protect your data (the same data is written to both drives), you’ll get the best performance in RAID 0, where data is striped (split) across two drives. RAID 0 usually delivers a shade under 2X the sustained throughput of a single drive; RAID 1, a shade under 1X. For my main battery of tests, I used the Seagate 14TB IronWolf Pro and BarraCuda Pro I had on hand combined in RAID 0. These are easily the fastest hard drives on the market—don’t expect the same performance with less capacious or slower drives. Remember that RAID 0, while much faster, offers no data redundancy, and doubles the failure points (if either drive goes bad, the array is unusable). 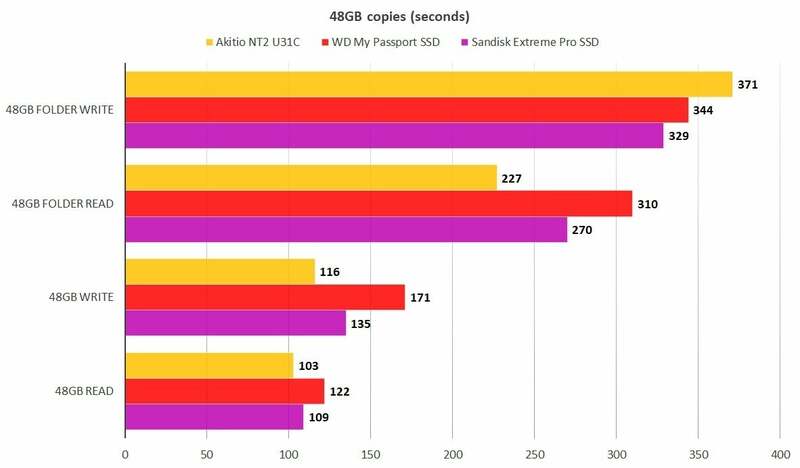 For sustained throughput, the NT2 U31C (with very fast hard drives inside) was nearly up to the Sandisk Extreme Pro and faster than the WD My Passport SSD. When it came to reading and writing our single large 48GB file (shown above), and even reading the 48GB set of smaller files and folders, the NT2 U31C compared very well with the external SSDs I tested it against. However, when writing smaller files and folders, the slower random access of spinning platters shows, though not to the point that it would on a busy file server. In point of fact, you’re not giving up a whole lot. CrystalDiskMark, shown below, perfectly illustrates that. Given the super-slow random write performance, you might’ve expected a slower performance with our file and folder test. That said, a relatively small percentage of the files in the folder test are as small as the 4K blocks used by CrystalDiskMark. The majority are several to dozens of megabytes in length. Fast sustained throughput, not-so-fast random access—the classic difference between hard drive and SSD technologies. That said, the NT2 U31C (gold bars) with its fast Seagate hard drives was pretty darn quick reading our 48GB set of files and folders. Longer bars are better. I’ve seen videographers, especially those using Final Cut Pro’s more intensive raw video, complain that their external drives can’t deliver the video fast enough. The NT2 U31C with fast hard drives in RAID 0 should, given a USB 3.1 Gen 2 port. Note that Thunderbolt 3 is expensive overkill with hard drives until you start combining them four or more at a time in something such as LaCie’s 5big or 12big. While, as mentioned, there are no 2.5-inch adapters included, the advertising on Akitio’s site does portray the NT2-U31C as capable of utilizing SSDs. I tried it with several combinations. When using unmatched capacities or brands, the results were not good—pathetic, in fact. With a matched pair of 1TB Seagate Barracuda SSDs, the synthetic benchmarks showed good, if inconsistent results, but real world copies hovered around the 300MBps mark. After about a half-dozen tries and several hours, I called it quits. It should just work; it didn’t. At least not as easily nor as well as it should have. 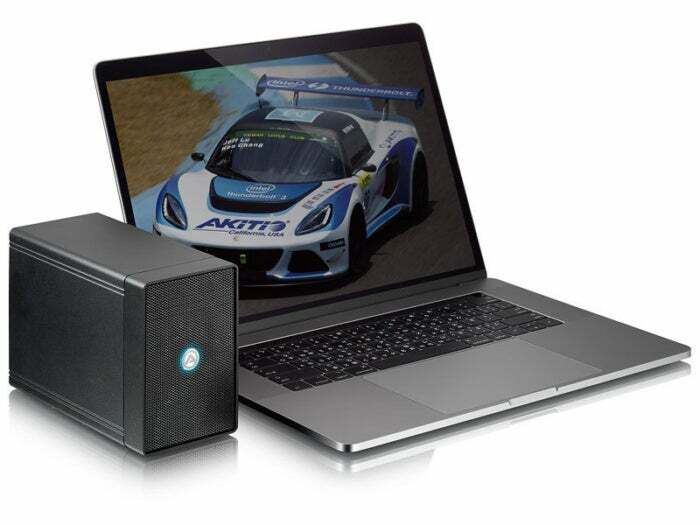 Akitio more or less nails it with the design of this box in terms of leveraging a pair of 3.5-inch hard drives. 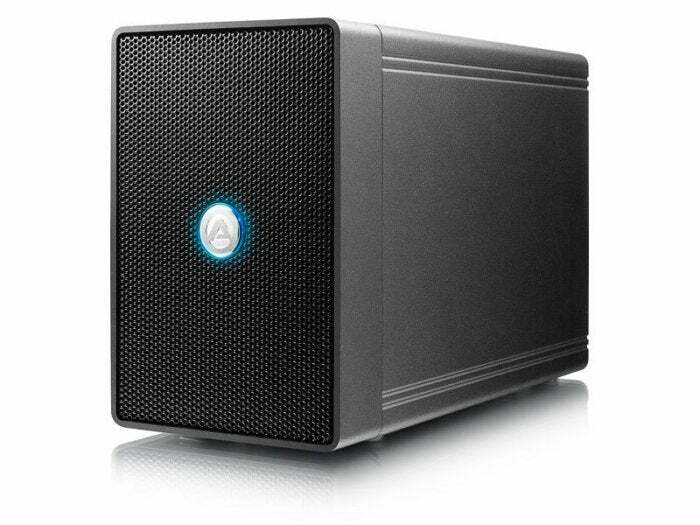 It’s solidly constructed, installation and RAID configuration are super-easy, and it performs well. Great stuff. But for 2.5-inch devices, look elsewhere. With two tool-less/adapter-less 3.5-inch drive bays, this is one of the easiest external RAID boxes we've tested. RAID 1, RAID 0, spanning and non-RAID (dual drive letters) modes are supported, and performance is quite good. There are no adapters for smaller drives, however, so consider this box for standard hard drives only.